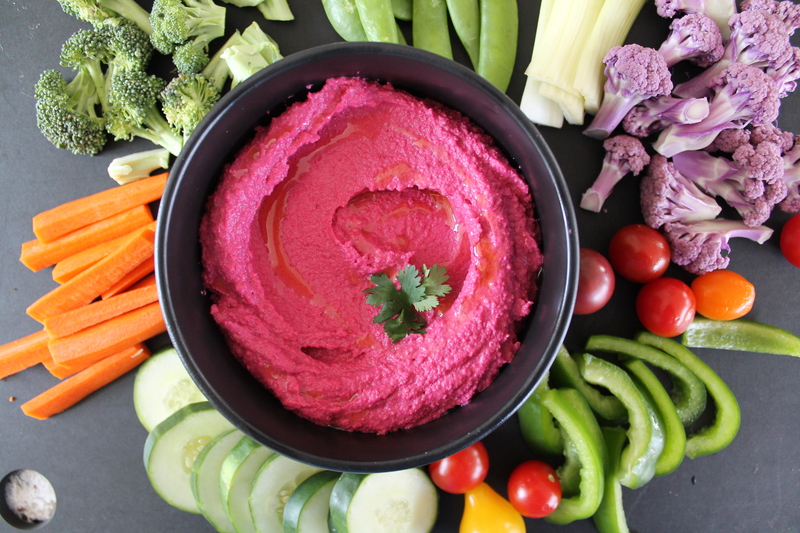 If you’ve never made hummus at home, then you are probably spending too much money on tubs of hummus at the grocery store. 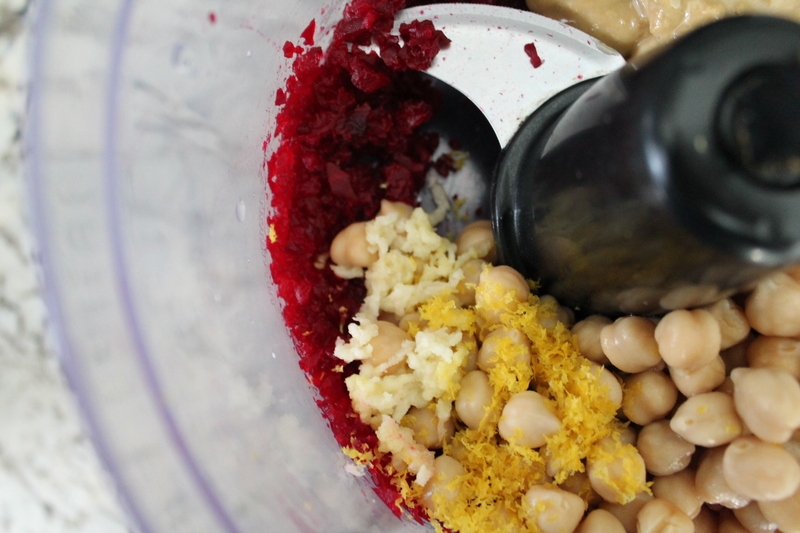 Hummus is literally as easy to make as it is to turn on a food processor. First, in this case, we need to roast a beet. No need to wash or peel the beet, just cut off the root and the green stems, wrap it in foil, and throw it in the hot oven for an hour. I do recommend setting the beet on a baking sheet to catch any purple juice that may seep out of the foil wrapper. The beet will become very tender, so that you can easily pierce it with a butter knife with minimal force. Let the roasted beet cool until you can handle it comfortably. I am impatient, so I pulled on my dishwashing gloves after about 10 minutes and got to work. Under running water, rub the skin off of the beet. This will also wash away any dirt. 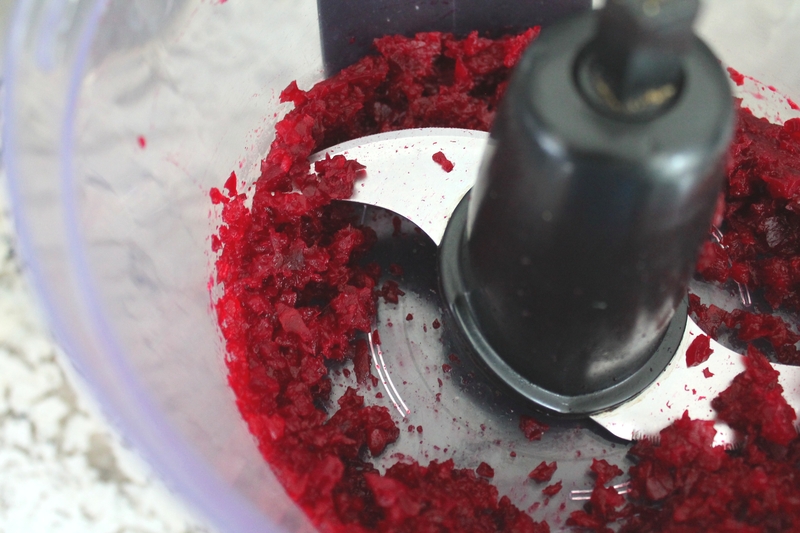 Cut the beet into several large pieces and place it in the food processor. Process until the bits are fairly even and small. Add all the remaining ingredients, the usual suspects for hummus: drained chickpeas, lemon zest, lemon juice, salt, garlic, tahini, ground coriander. 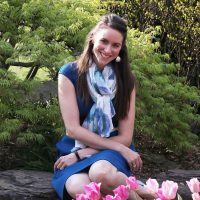 I have seen beet hummus recipes that use walnuts, too, which sounds glorious…except that we are investigating Caitlin for a walnut allergy, so we are abstaining from walnuts at the moment. Pulse until a fine mash forms. With the food processor running, stream in the olive oil. The hummus should become smooth and soft. Taste and adjust seasonings as needed (more lemon? more garlic? more pepper?). Garnish with a little fresh cilantro and olive oil, if desired. And voilà! Heat oven to 375. Wrap the trimmed beet tightly in foil and place on a baking sheet. Roast in the warm oven for 45 minutes, until the beet can be easily pierced by a butter knife. 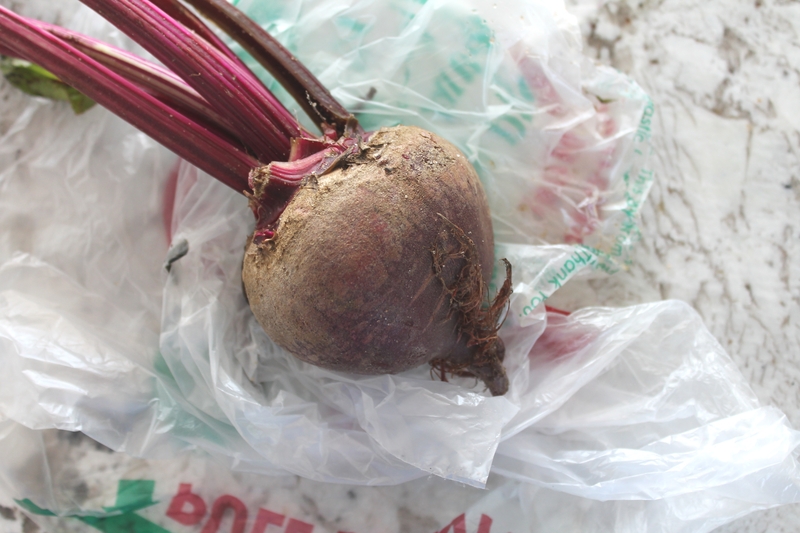 Allow the beet to cool for 15–20 minutes, then rub the skins off under cool, running water. 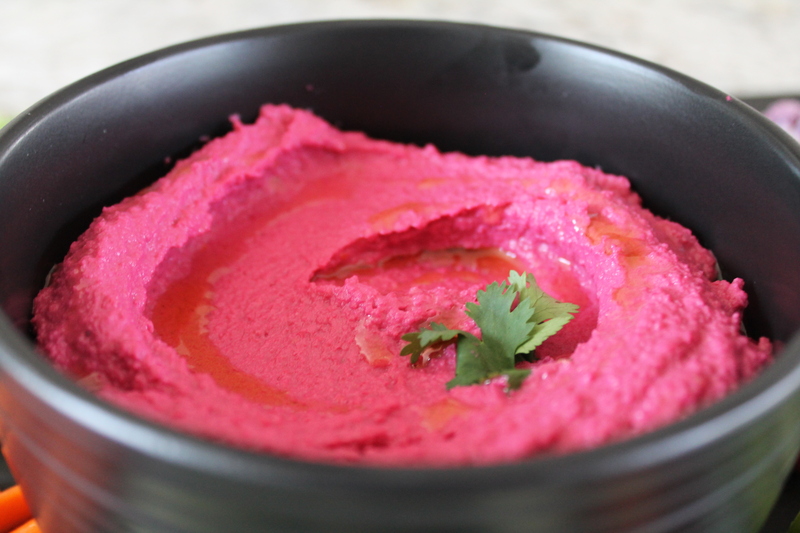 Cut the beet into quarters and place in the bowl of a food processor. Puree the beet. Add all the remaining ingredients, except for the olive oil. Puree until fine and even. With the food processor running, stream in the olive oil. 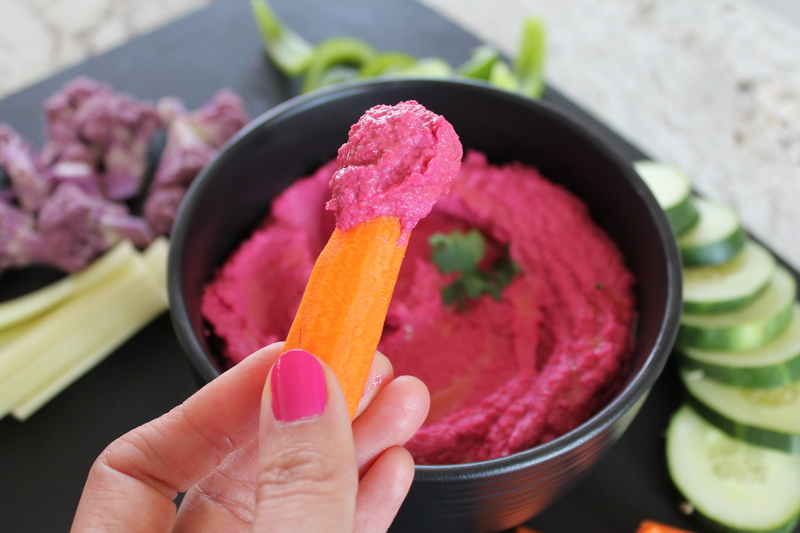 Serve with raw vegetables for a vegan snack!